Please type "YES" below to verify that you have read the dimensions and have seen the images with the size comparison of the pieces in this activity set. Catch a rainbow! 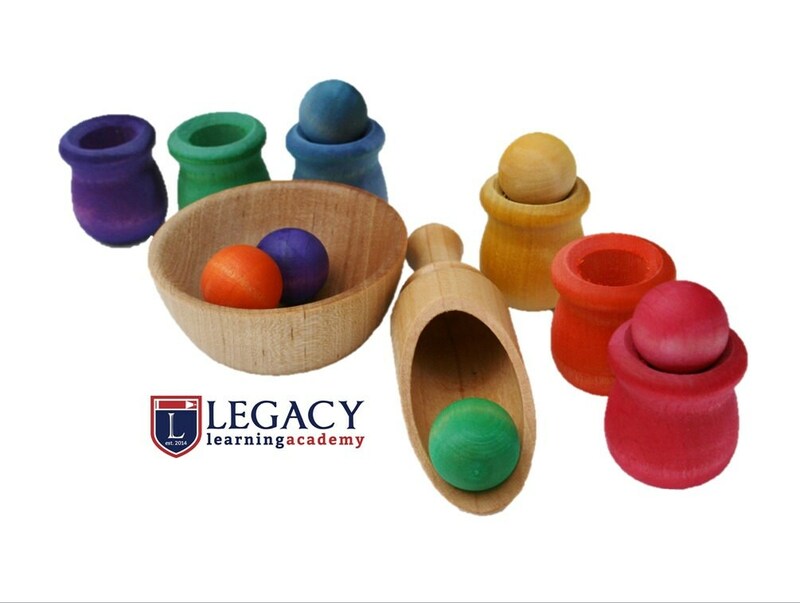 This rainbow sorting set or wooden sorting game is ideal for even the littlest learners to grasp and play. 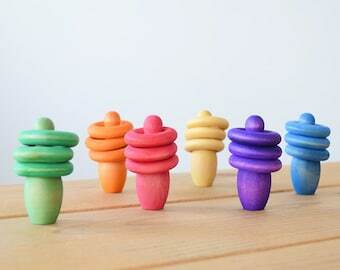 Handcrafted to entice color-recognition and fine-motor skills, this colorful matching activity will give your child plenty of hands-on play as he sets to work stacking, sorting and matching. It includes six wooden balls and six matching bean pots along with a wooden sorting bowl and scoop to facilitate active play. It will arrive neatly packaged in a muslin travel bag for fun at home or on the go. It also makes an impressive gift idea for any occasion. It is an original Legacy Learning creation. Order now to guarantee availability. (1) Wooden bowl - 2 1/2"
(1) Wooden scoop - 3 1/2"
This was a present for my friend's daughter and she loves it! Very well made and perfect for little hands. Fast ship. The colors weren’t as vibrant as I had hoped. But a cute set. The dog accidentally got a marble and chewed it...which was my own fault and much of the color was rubbed off from being wet. But we still play with it! I bought this as a christmas gift for my three year old niece. She loves it! She new right away the put each ball in it's appropriate colored jar. Definitely a good game for fine-tuning her motor skills. Great seller! Thank you for all your help tracking the package. Also the product is wonderful great quality, toddler loves it!!!! Thank you! Highly highly reccomend!